Yeah, yeah...I know you're not supposed to judge a book by its cover, but really!! Have you ever seen anything more cheerful than the cover of Chris Cozen's Acrylic Color Explorations? Published by North Light Books, Chris's book is completely captivating and full of color information that is presented in an easy-to-apply way. Sure, you already know the color wheel, but did you know that you can create color wheels and charts that evoke different moods? 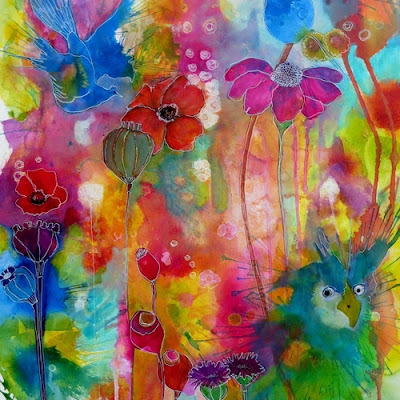 These are based upon shade, tints, or tones of alternative "primary" colors. By following along with Chris's demonstrations and exercises, you will learn how to guarantee that the colors you pick will work together. 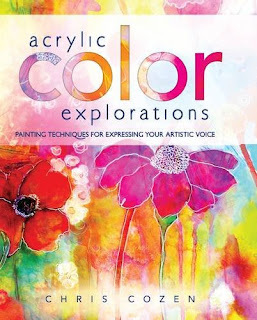 I'm extremely excited by this book and her concepts, because I work almost exclusively with acrylics in my fabric and paper pieces, and I know from sad personal experience that not every blue and yellow is going to give you a beautiful green! You'll probably want to work through this book several times Not only are the exercises helpful, but there are just so many variations you can try with each one. In addition, informative profiles with painters are included which you will want to read through and absorb. Sounds like a good one! And you're right, that cover is so beautiful.